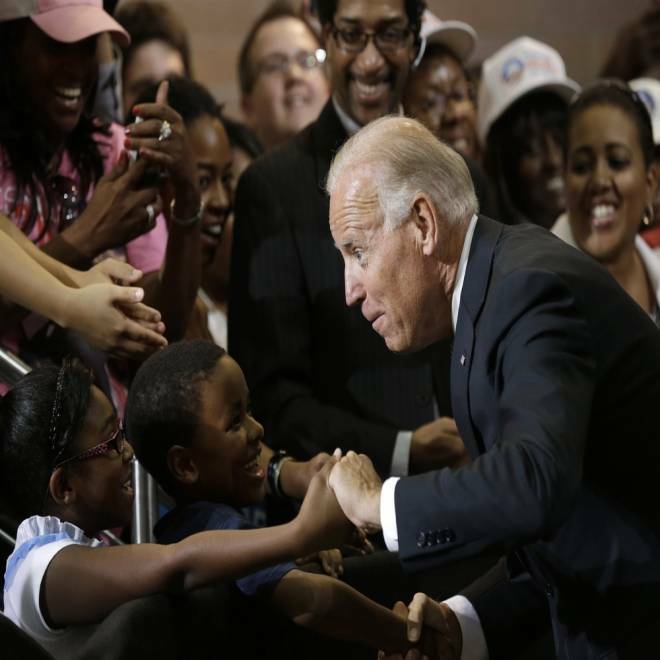 Vice President Joe Biden greets Lawrence Smith, 8, and Madison King, 9, both of Van Buren Township, Mich., during a campaign stop at Renaissance High School, Wednesday, Aug. 22, 2012, in Detroit. DETROIT -- For Joe Biden, all politics is personal, from his relationships with past presidents to the little white lies his siblings told their ailing mother. Campaigning Wednesday in famously recession-ravaged Michigan, Biden bemoaned the consequences of the GOP ticket's plans for Medicare and said that their proposed changes would exacerbate the sacrifices already made by families on behalf of their elderly relatives. Noting that he and his siblings have been financially successful, the vice president offered the delicate details of his family members combining financial resources to care for mother Catherine "Jean" Biden, who died in 2010 at the age of 92. "It was still a struggle to take care of all my mom's bills," he told a crowd of over a thousand at Renaissance High School. "We were able to do it, no complaint, it was an honor. But you know what it did, we had to lie to my mom and tell her, 'No honey, this is all covered by your Medicare, this is all covered by the sale of your home,' which it wasn't." "Because do you know any parent who wants to be a burden for their children?" he added, arguing that the "voucherization" of Medicare proposed under the Ryan budget would further hurt the elderly's abilities to cover their own expenses. The vice president, who commonly cites his personal friendship with President Barack Obama, compared the current leader of the free world with the gaggle of other commanders-in-chief he says he's known personally. "I've known eight presidents, three of them intimately," noted the six-term senator after citing the "four to six hours a day" he typically spends with Obama. "I have never once in the difficult decisions he's had to make heard him ask me or anyone else 'what are the politics of this for me?'" 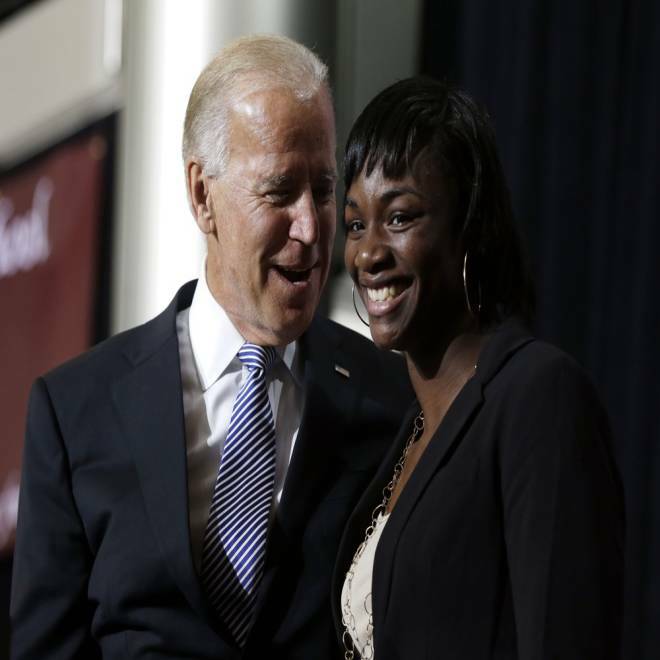 Perhaps the most resonant endorsement of the Obama ticket on Wednesday came not from Biden but from his introducer, 17-year old Olympic gold medalist Claressa Shields, a boxer from Flint, Mich.
Vice President Joe Biden introduces Olympic boxing gold medalist Claressa Shields during a campaign stop at Renaissance High School, Wednesday, Aug. 22, 2012, in Detroit. "It's pretty cool knowing when you represent your country, you've got a president and a vice president who represent you," said Shields, who was greeted with wild applause. "We've had tough times in Michigan, but we never give up. We just get up and keep going." That message - and Shield's famed toughness - were echoed by Biden as he praised the Motor City's resilience. "My dad used to say the measure of a man or woman wasn't whether they got knocked down but how quickly they got back up," he said. "And guess what? Detroit's getting back up!"